There have been no fewer than four men to carry the name (and gas) of Mr Fear. 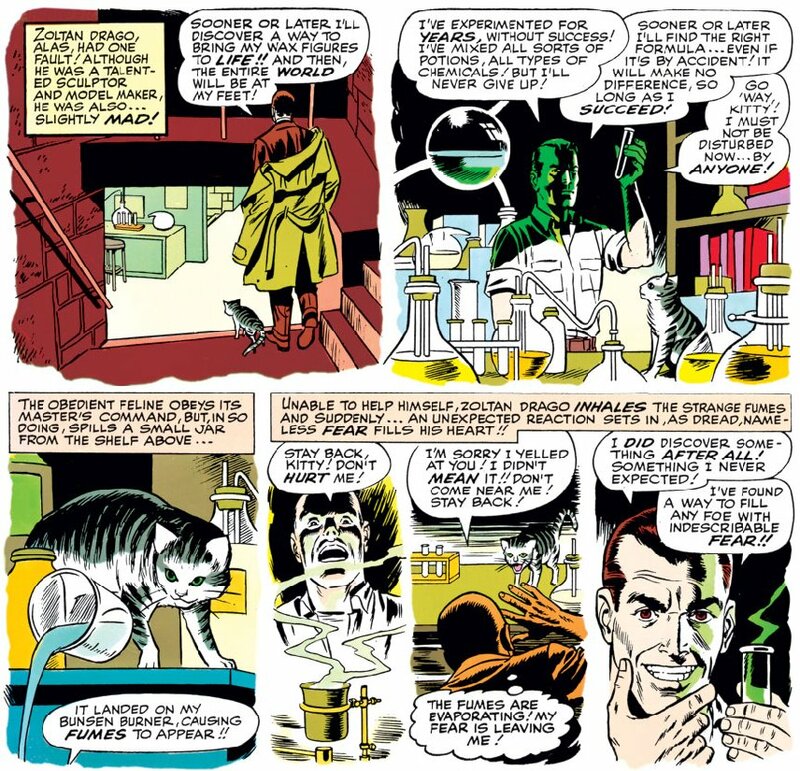 The very first was Zoltan Drago, whose origin story – as seen below, from Daredevil #6 by Stan Lee and Wally Wood – details the fortuitous circumstances which lead to his discovery of fear gas. As mentioned, Mr. Drago was a real madman in the classic Dr. Frankenstein sense since his original goal was simply to create a potion to make his wax figures come to life. Because, you see, he was also the owner of a rather impressive collection of heroes and villains on display to the public, and later in this issue, we see him unveil the most recent addition to his collection: The life-size Daredevil wax doll! I think it’s interesting that Drago would need the love a little kitten in the first place. Maybe he wasn’t so evil after all. Anyway Zoltan Drago and Starr Saxon had the greatest names ever. As a matter of fact, I challenge anyone to top them.